Hello Poppets. 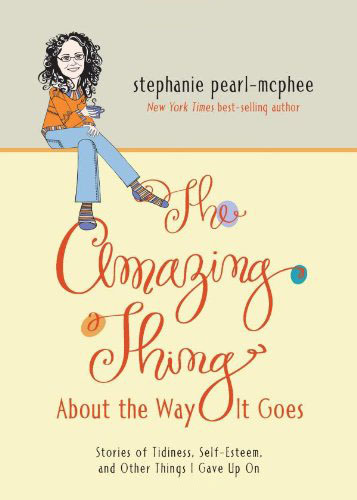 I know it’s Sunday, and I don’t usually post on the weekend, but book tours wipe away all the days of the week. (Although I was trying really, really hard to keep track of Sunday on account the time change but then I realized I was flying to Arizona, and that means there’s no time change until I fly out of Arizona.) I’m in Phoenix (Tempe, technically) and last night there was a really great event at Changing Hands that I’ll tell you about tomorrow, but for now, San Francisco? A short list of Surprising Things that happened in San Francisco. What a wickedly good time I had. You can’t tell in that picture but some of the most fun people ever are in that crowd. I loved them. (It was at Books Inc., and I left behind some signed books, if you had your heart set on getting one, and I’m not coming near your home.) Hidden in there are some people who’ve been hanging with this blog (and their own) for a long time, like the lovely Alison H, and Carrie, of Irish Girlie Fame.) Lingering around in the back though, is Julie, from Cocoknits. When I was done talking and signing, she came up to me and gave me a little present. She gave me a hard copy of one of her patterns that I’d bought online. That “linen vest thing” that I’ve been going on about for the last few weeks, the one that I’d said I was going to finish on the tour? 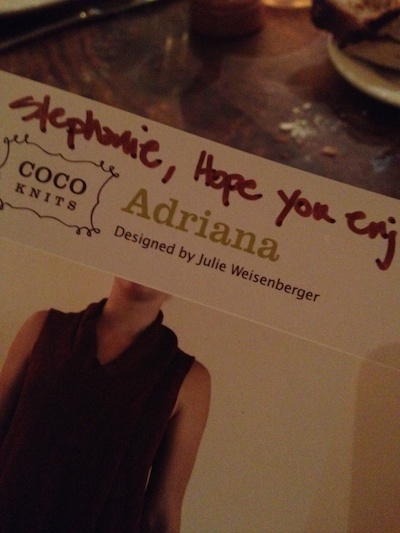 It’s Adrian – one of Julie’s patterns. Debbi and I both tried it on at the Habu booth at Madrona, and we both loved the shape, the flow, how it fit… Killer. 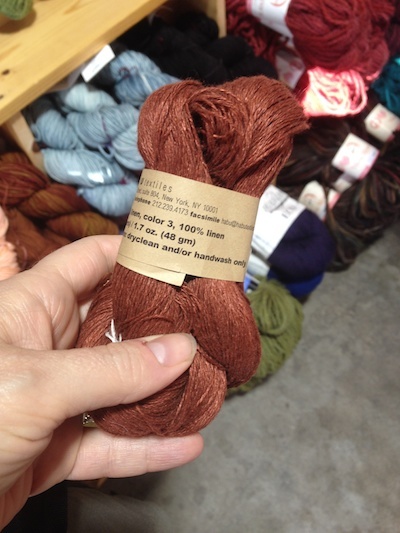 So we each bought our three skeins of linen, and we’ve been cranking it out since. It hasn’t been without incident, both Debbi and I thought something wasn’t right, something just wasn’t looking the way it should, and we checked and double checked the pattern, had conversations about how it really didn’t look right, but all the conversations ended with affirming that we had tried it on, we had loved it, we were getting gauge, and there was no errata. It would come together, we said. Come together it did – sort of. I finished it on Thursday night, but I had lots of yarn left, and a niggling feeling that it wasn’t long enough, so that evening I ripped out the cast on, picked up a million stitches around the bottom, and spent the flight to San Francisco adding a few inches to the bottom. and blocked it, convinced that it would be fine after that. It didn’t look anything like I was hoping. 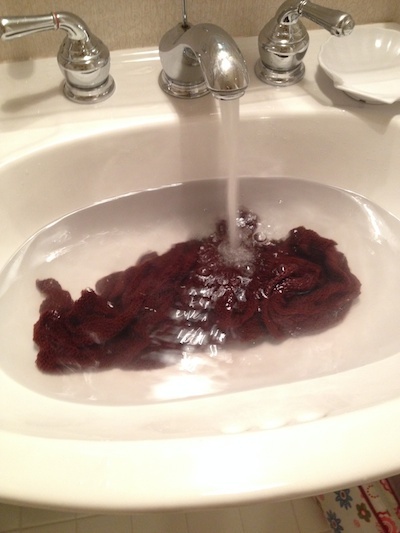 I was actually disappointed, but I tried to think it would look better dry – which wasn’t very logical. Surprise #2 Off I went, with my sad little Adrian on the floor, and at the end of the night Julie comes up to me and says something vague like “Oh, you’re knitting this pattern, I thought you might like to have a hard copy” and she hands me this. 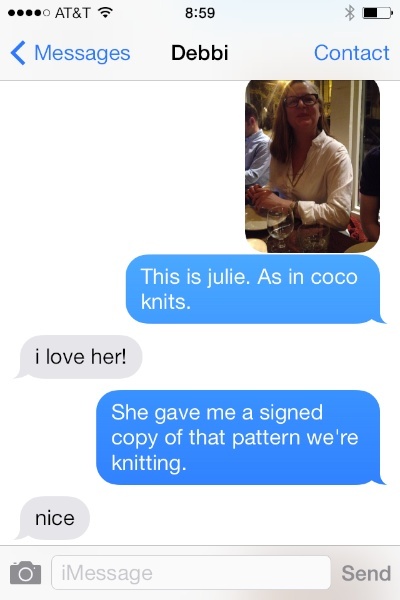 Julie: No, you’re knitting the one from Habu, right? That’s ADRIANA. You’ve got the name wrong. The only one at Habu is Adriana. That’s what you’re making. Me: (Heart starting to pound – world a little black at the edges) Oh. No. I’ve not got the name wrong, I’ve knit the wrong one. Debbi’s knit the wrong one. 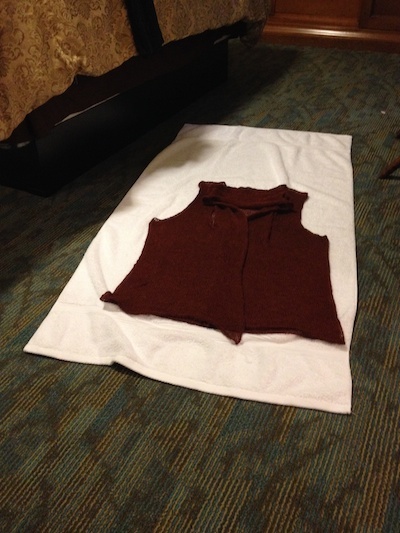 It doesn’t look right because it’s not right, it’s not the vest thing we meant to knit at all. We have knit a different pattern. I texted Debbi almost straight away. 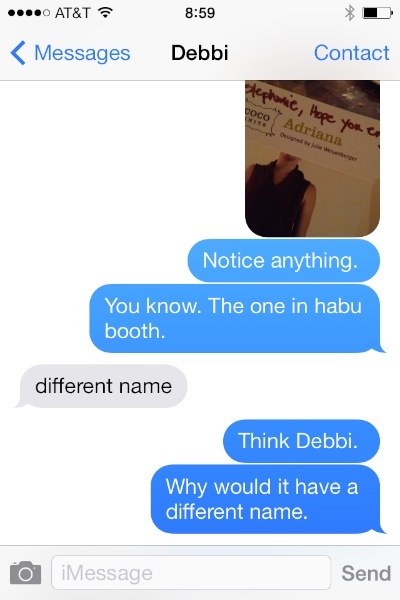 I felt bad that Debbi was alone when this was going to come over her. 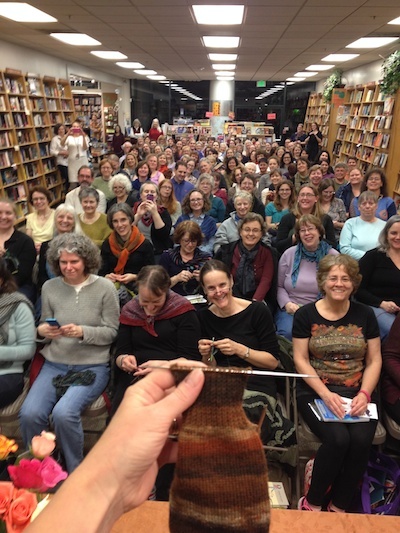 What the f**k did we knit indeed. I can’t tell you what Debbi said after that, or what I said to her, because it was language unbecoming knitters, let me tell you. That thread represents the most civil part of the discourse that followed, and there’s no way I could make it public. We have knit the wrong thing by accident and it was miles of stockinette, and… man. 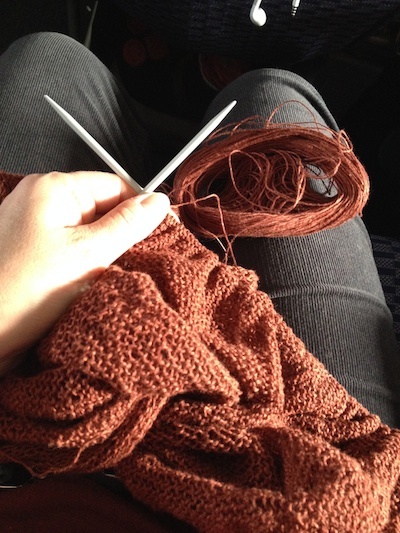 The worst part is that it takes 3 skeins of linen to knit Adrian, and 4 to knit Adriana. 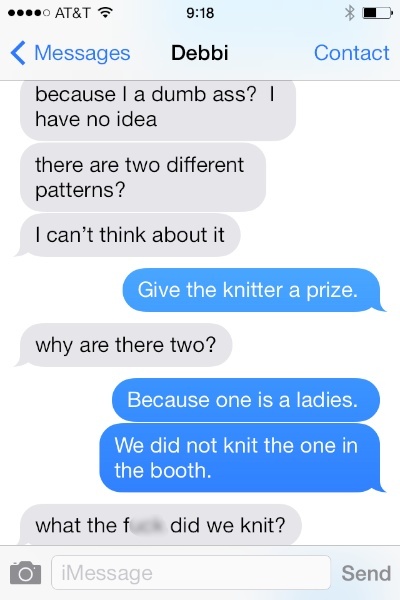 I didn’t even have enough to knit the right one. I did know that Verb carried Habu, so I took a wander over there the next day. I didn’t know if I was hoping they had it or not. Later today, when I think I can face it, I’m going to start over.